Cocoa Dev Central: Internet Version Checking. Cool little technique for using an XML file on a web server to provide built in version checking capabilities. Of course the flat file could be replaced with a proper web service that would allow you to do this checking from an AppleScript instead of a full blown Cocoa app. I may play with doing this from Manila Envelope. I was going to transcribe some of the notes I scribbled on hotel stationery and a Statue of Liberty memo cube purchased from Newark Airport today, but I forgot to dig them out of my luggage before I left the apartment today. 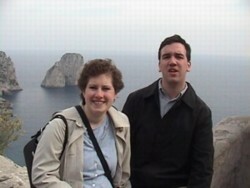 So here’s a photo of Lisa and me from Capri to tide you over. Any day, in the hands of these photographers, you may see stately pictures of papa and mamma, Johnny and Bub and Sis, or a couple of country cousins, all smiling vacantly, and all disposed in studied and uncomfortable attitudes in their carriage, and all looming up in their awe-inspiring imbecility before the snubbed and diminished presentment of that majestic presence whose ministering spirits are the rainbows, whose voice is the thunder, whose awful front is veiled in clouds, who was monarch here dead and forgotten ages before this hackful of small reptiles was deemed temporarily necessary to fill a crack in the world’s unnoted myriads, and will still be monarch here ages and decades of ages after they shall have gathered themselves to their blood relations, the other worms, and been mingled with the unremembering dust. There is no actual harm in making Niagara a background whereon to display one’s marvelous insignificance in a good strong light, but it requires a sort of superhuman self-complacency to enable one to do it.